I have a confession. There is this place in Austin called TacoDeli that has an amazing salsa bar. Sometimes, I will make omelets at home and then buy a cup of coffee from TacoDeli, just so I can raid the sample cups at the salsa bar to take home to top my eggs. While not technically stealing, this practice is most likely frowned upon by the management at TacoDeli. The sauce we love the most is a spicy creamy avocado sauce, which most definitely has dairy and probably other ingredients I would rather not consume. 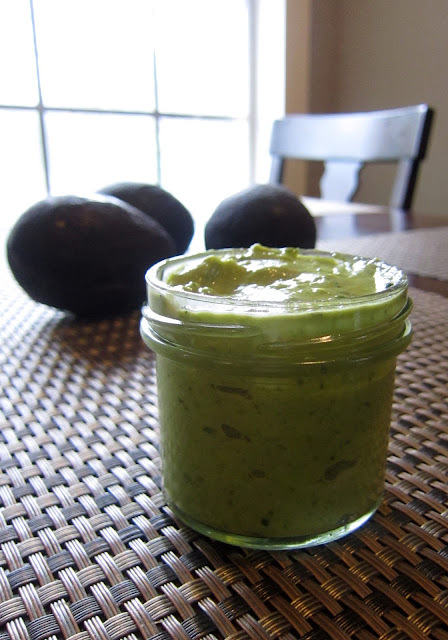 So instead of raiding the taco shop this weekend, I took a shot at making the avocado sauce myself. What resulted is like crack! I can't stop eating it. You can put it on anything and dip it like guacamole. Okay fine, I ate it with a spoon. You can use a blender or a magic bullet. If you don't have a magic bullet, you are missing out. I use it all the time. Boil the jalapeño, whole, in a small pot of simmering water for 5 minutes. Remove from the pot and let cool. Meanwhile, add the remaining ingredients to the blender. When the jalapeño is cool enough to handle, remove the stem and seeds. Add to the blender. Whirl everything together until nice and smooth! You may need to add more coconut milk to desired consistency. Cover and refrigerate for up to 3 days. Holy Crap! I am going to make this tonight! I think the coffee & free salsa idea is brillant! I just heard it's vegan! How great! I am a Dona Sauce addict and I'm glad to know I'm not the only one snagging extras without even buying the tacos. And this recipe won't help your addiction; it'll fuel it. Oh well. The avocado sauce is easy and delicious. It good to have with the morning breakfast, instead of butter you can go for avocado sauce or you can dip fried potatoes. It can go with any diet plans.